Wingless viviparae of Pterocomma rufipes are variably pigmented, grey or dull reddish brown to dark brown with spots of powdery wax. The antennae are about half as long as the body with the terminal process that is 1.3-2.2 times as long as the base of the last antennal segment. All abdominal segments have large marginal plates. There are conspicuous pairs of large pleurospinal plates on segments 6 and 7 and a crossband on segment 8. The siphunculi are yellowish and slightly or markedly swollen. Winged Pterocomma rufipes viviparae have variably developed dorsal abdominal cross-bands. 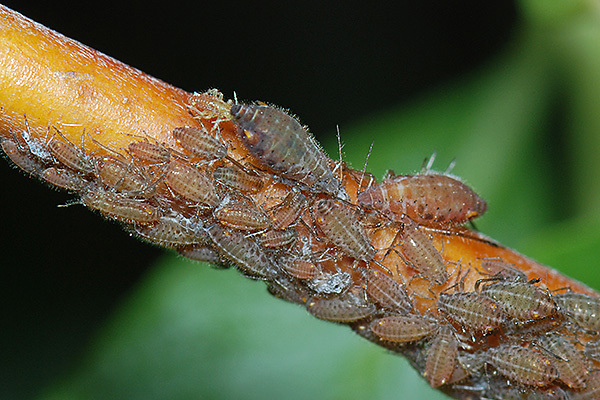 The rufous willow bark aphid lives on twigs and young branches of many species of willow (Salix species). 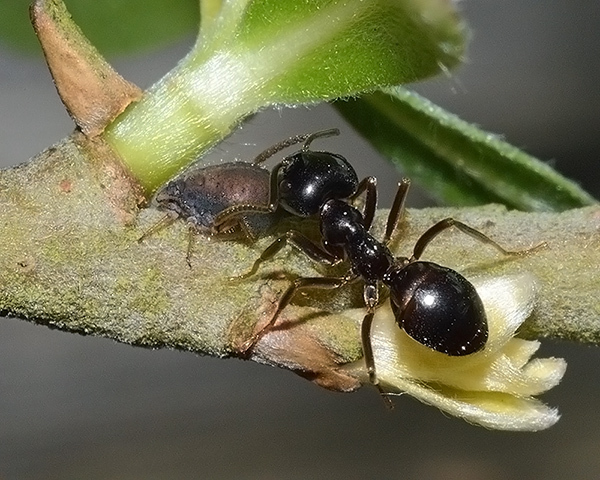 Colonies are often visited by ants. Sexual forms occur in September. Pterocomma rufipes occurs in north-west and central Europe, Mongolia, Siberia, and has been introduced to Canada. We have found Pterocomma rufipes in various locations in East & West Sussex, on willow, usually in May or June. This species is usually somewhat less common than its close relative, Pterocomma pilosum. Molnar et al. (2003) looked at the population dynamics of Pterocomma rufipes on willow. There were two peaks of abundance, in mid-May and mid-October, with the spring peak larger than that in the autumn. Like Pterocomma pilosum they were parasitized by the specific parasitoid Euaphidius cingulatus, but rates of parasitism were much lower. Pterocomma rufipes may or may not be attended by ants. 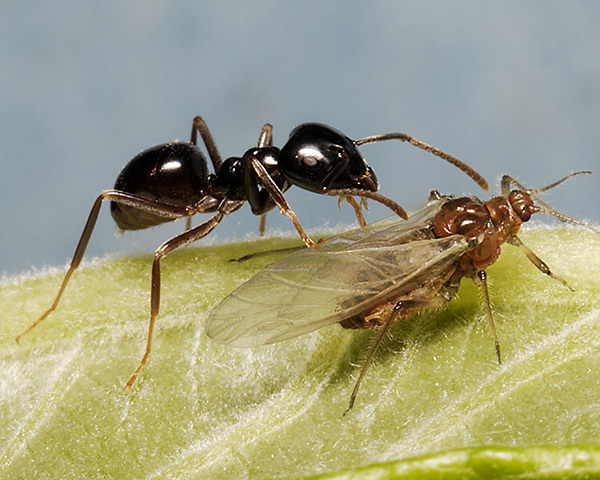 The picture below shows an alate being attended by a jet black ant (Lasius fuliginosus). Molnar et al. (2000) found that Lasius fuliginosus was responsible for most of the ant-aphid interactions on willow. We found this Formica lugubris attending a Pterocomma rufipes mummy. If no ants in attendance, there may be large numbers of predators around colonies. The picture below shows an adult harlequin ladybird (Harmonia axyridis) in close proximity to several immature Pterocomma rufipes. 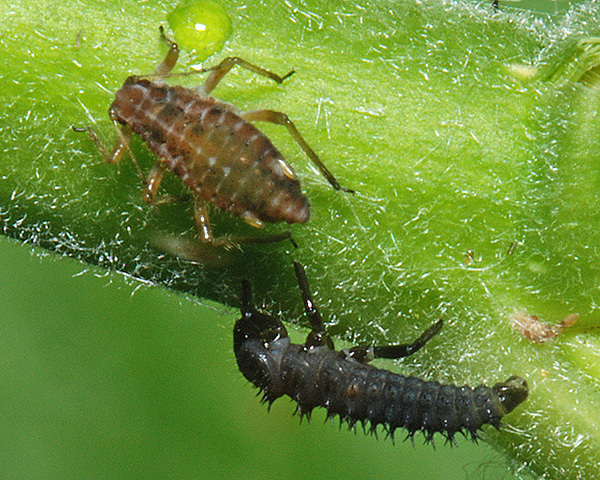 The first picture below shows a coccinellid larva about to capture am immature Pterocomma rufipes. 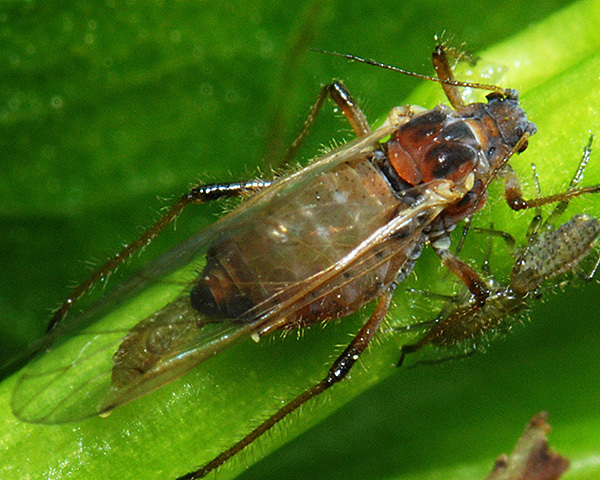 The second picture shows an adult Pterocomma rufipes with solidified wax around its siphunculi, testament to a past predator attack upon said aphid. Dixon (1958) was the first to correctly identify the defensive capability of siphunculi. They produce wax, which rapidly solidifies on the mouthparts of an attacking predator (Edwards, 1966) - as well as (usually) releasing an alarm pheromone, which alerts other aphids to the danger (Bowers et al., 1972). 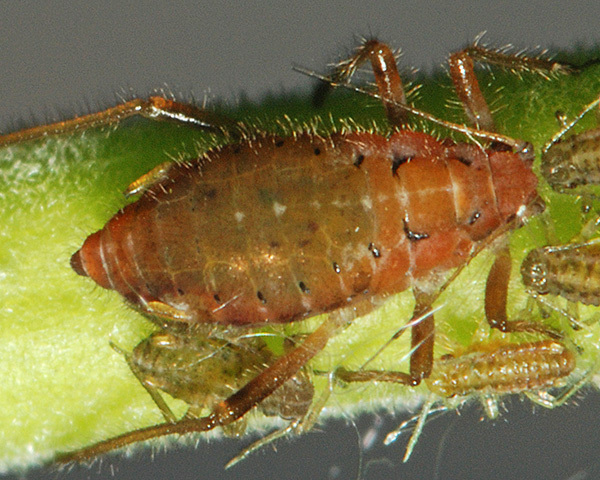 Another hazard faced by Pterocomma aphids is parasitism by trombidiid mites as shown in the picture above. 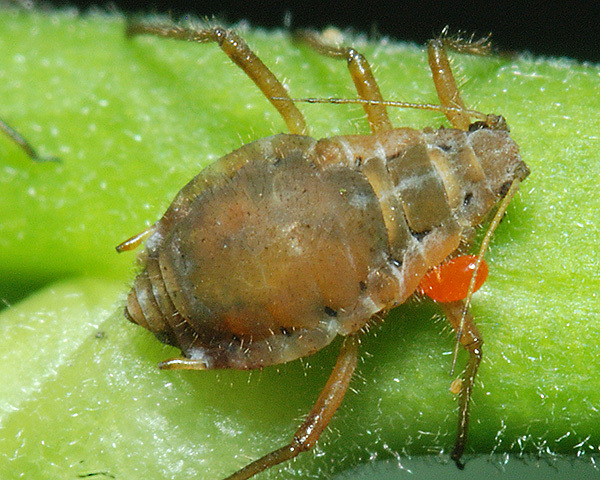 An aphid will probably survive attachment by a single mite, albeit the aphid's reproductive rate will be reduced, but multiple infestations can kill an aphid (Zhang, 1998). 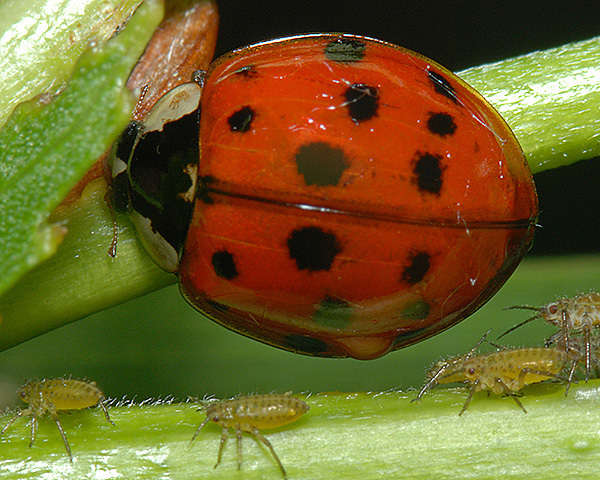 We provide more information about mites parasitizing aphids in Mites parasitizing aphids and predatory mites. Pterocomma rufipes has been recorded on about 36 Salix species. Blackman & Eastop list over 120 species of aphids as feeding on willows worldwide, and provides formal identification keys for aphids on Salix. Of the 41 aphid species Blackman & Eastop list as feeding on white willow (Salix alba) Baker (2015) lists 24 as occurring in Britain: Aphis farinosa, Aphis gossypii, Cavariella aegopodii, Cavariella aquatica, Cavariella archangelicae, Cavariella konoi, Cavariella pastinacae, Cavariella theobaldi, Chaitophorus capreae, Chaitophorus salicti, Chaitophorus salijaponicus niger, Chaitophorus truncatus, Chaitophorus vitellinae, Phylloxerina capreae, Phylloxerina salicis, Plocamaphis amerinae, Plocamaphis flocculosa ssp.brachysiphon, Pterocomma jacksoni, Pterocomma konoi, Pterocomma pilosum, Pterocomma rufipes, Pterocomma salicis, Stomaphis longirostris, and Tuberolachnus salignus. Of the 30 aphid species Blackman & Eastop list as feeding on common sallow (Salix caprea) Baker (2015) lists 24 as occurring in Britain: Aphis farinosa, Cavariella aegopodii, Cavariella archangelicae, Cavariella intermedia, Cavariella konoi, Cavariella pastinacae, Cavariella theobaldi, Chaitophorus capreae, Chaitophorus horii, Chaitophorus salicti, Chaitophorus salijaponicus niger, Chaitophorus truncatus, Chaitophorus vitellinae, Pachypappa warschavensis, Phylloxerina capreae, Plocamaphis flocculosa, Pterocomma jacksoni, Pterocomma konoi, Pterocomma pilosum, Pterocomma rufipes, Pterocomma salicis, Stomaphis longirostris, and Tuberolachnus salignus. Of the 26 aphid species Blackman & Eastop list as feeding on grey sallow (Salix cinerea) Baker (2015) lists 21 as occurring in Britain: Aphis farinosa, Cavariella aegopodii, Cavariella archangelicae, Cavariella intermedia, Cavariella konoi, Cavariella pastinacae, Cavariella theobaldi, Chaitophorus capreae, Chaitophorus salicti, Chaitophorus salijaponicus niger, Chaitophorus truncatus, Chaitophorus vitellinae, Phylloxerina salicis, Plocamaphis flocculosa, Pterocomma jacksoni, Pterocomma konoi, Pterocomma pilosum, Pterocomma rufipes, Pterocomma salicis, and Tuberolachnus salignus. Of the 26 aphid species Blackman & Eastop list as feeding on crack willow (Salix fragilis) Baker (2015) lists 20 as occurring in Britain: Aphis farinosa, Cavariella aegopodii, Cavariella archangelicae, Cavariella konoi, Cavariella pastinacae, Cavariella theobaldi, Chaitophorus horii ssp. beuthani, Chaitophorus salicti, Chaitophorus salijaponicus niger, Chaitophorus truncatus, Chaitophorus vitellinae, Pemphigus saliciradicis, Phylloxerina salicis, Plocamaphis amerinae, Pterocomma jacksoni, Pterocomma konoi, Pterocomma pilosum, Pterocomma rufipes, Pterocomma salicis, and Tuberolachnus salignus. Bowers, W.S. et al. (1972). 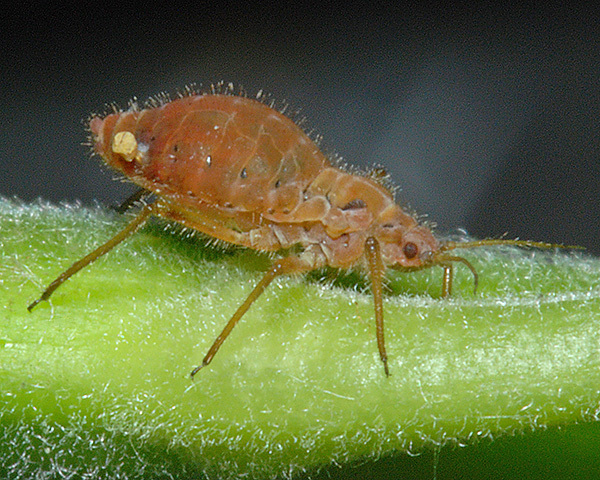 Aphid alarm pheromone: isolation, identification, synthesis. Science 177, 1121-1122. Dixon, A.F.G. (1958). 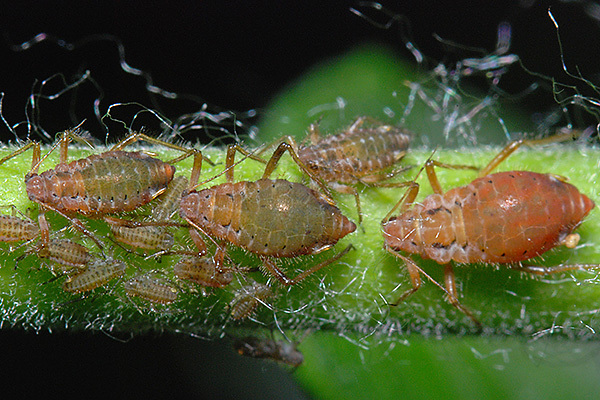 The protective function of the siphunculi of the nettle aphid, Microlophium evansi (Theob.). Entomologist's Monthly Magazine 94, 8.